Find out how to use PHP with the *other* open-source database system. There's something patently unfair going on here. For some reason, almost every PHP tutorial on the planet makes the implicit assumption that if you're using PHP with a database, that database is going to be MySQL. Now, I have absolutely nothing against MySQL - I think it's a great product, and I use it fairly often in my development activities. However, it's not the only good open-source RDBMS out there - most developers have been playing with PostgreSQL for quite a while now, and quite a few of them would love to integrate their PostgreSQL backend with PHP. The only problem is, they have no idea where to start - the functions used to communicate with a PostgreSQL database are different from those used in a MySQL environment, and the documentation out there could do with some updating. Well, it's time to bring some balance back to the universe. Which is why this article looks at PHP from the PostgreSQL developer's point of view, explaining how PHP can be used with the PostgreSQL database system. If you're a MySQL user, you probably don't need to know any of this; if you're a PostgreSQL fan, on the other hand, you can breathe a sigh of relief and flip the page. Note that your PHP build must support PostgreSQL in order for the examples in this article to work correctly. You can include PostgreSQL support in your PHP build by adding the "--with-pgsql" configuration parameter when compiling the package. Note also that PHP 4.2.0 and better contains fairly extensive changes to the function names used in the language's PostgreSQL module; this article uses the new function names and assumes that you're running PHP 4.2.x. Drop by http://www.php.net/manual/en/ref.pgsql.php for more information on the changes, and the corresponding function names for older versions. I'm not going to get into the details of configuring and installing either PostgreSQL or PHP here - the documentation included with both those packages has more than enough information to get you started, and the accompanying Web sites contain lots of troubleshooting information should you encounter problems. In case you don't already have these packages installed on your development system, drop by the Web sites listed above, get yourself set up and come back once you're done. Assuming that you have a properly configured and installed setup, the first step is to start both the database server and the Web server. Note that the PostgreSQL server must be started as the special "postgres" user created during the installation process, and the startup invocation must include the additional "-i" parameter to allow TCP/IP connections to the server. Now check whether or not the data has been successfully imported with a SELECT query (the SELECT SQL statement is used to retrieve information from a database) via the interactive PostgreSQL monitor program "psql". which, in English, means "count all the records in the table addressbook and give me the total". If your output matches what's listed above, take a celebratory sip of Jolt - you're in business! Now, how about doing the same thing with PHP - fire a SELECT query at the database, and display the results in an HTML page? There are currently 3 records in the database. In order to begin communication with the PostgreSQL database server, you first need to open a connection to the server. All communication between PHP and the database server takes place through this connection. In order to initialize this connection, PHP offers the pg_connect() function. This function then returns a "link identifier", which is stored in the variable $connection; this identifier is used throughout the script when communicating with the database. Now that you have a connection to the database, it's time to send it a query via the pg_query() function. This function needs two parameters: the link identifier for the connection and the query string. The result set returned by the function above is stored in the variable $result. This result set may contain, depending on your query, one or more rows or columns of data. You then need to retrieve specific sections or subsets of the result set with different PHP functions - the one used here is the pg_num_rows() function, which counts the number of rows and returns the value needed. There are several other alternatives you can use at this point, which will be explained a little further down. Finally, each database connection occupies some amount of memory - and if your system is likely to experience heavy load, it's a good idea to use the pg_close() function to close the connection and free up the used memory. Now, that was a very basic example. How about something a little more useful? This next example will query the database, return the list of addresses, and display them all as a neatly-formatted list. As in the previous example, the script first sets up a connection to the database. The query is formulated and the result set is returned to the browser. In this case, since I'm dealing with multiple rows of data, I've used the pg_fetch_row() function in combination with a "for" loop to iterate through the result set and print the data within each row. The pg_fetch_row() function returns the columns within each row as array elements, making it possible to easily access the values within a record. By combining it with a "for" loop, I can easily process the entire result set, thereby displaying all returned records as list items. Finally, in case you're wondering, the pg_last_error() function returns the last error generated by the server - combined with die(), this provides an effective, if primitive, debugging mechanism. Of course, there's more than one way of extracting records from a result set. The example on the previous page used an integer-indexed array; this one evolves it a little further so that the individual fields of each records are accessible as keys of a hash, or string-indexed array, via the pg_fetch_array() function. which returns every row as a hash with keys corresponding to the column names. In this case, each row is returned as a PHP object, whose properties correspond to field names; these fields can be accessed using standard object notation. One of the nice things about PostgreSQL - and one of the reasons why many developers prefer it over MySQL - is its support for transactions (in case you didn't know, this refers to the ability to group a series of SQL statements together so that they are executed either together, or not at all). You can find more information about transactions online, at http://www.postgresql.org/idocs/index.php?tutorial-transactions.html - and if you already know what they are, here's an example which demonstrates how they may be used in a PHP context with PostgreSQL. Technically, there's nothing new here - this script uses the same functions you've seen in preceding examples. The difference lies in the use of multiple SQL statements to begin and end a transaction block, and in the use of COMMIT and ROLLBACK statements to commit and erase records from the database. Error in query: SELECTA * FROM addressbook. ERROR: parser: parse error at or near "selecta"
The pg_last_error() function displays the last error returned by PostgreSQL. Turn it on, and you'll find that it can significantly reduce the time you spend fixing bugs. Finally, how about one more example to wrap things up? This next script contains a form which can be used to enter new addresses into the table, together with a form processor that actually creates and executes the INSERT statement. As you can see, this script is broken up into two main sections - the appropriate section is displayed depending on whether or not the form has been submitted. 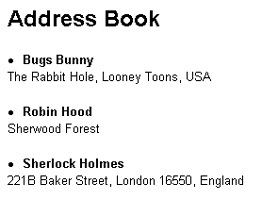 The first part merely displays an HTML form, with fields corresponding to the columns in the "addressbook" table. Once the user enters data into these fields, the same script is called again; this time, the second half will get executed. An SQL query is generated from the data entered into the form, and this query is executed using the pg_query() function you've become familiar with. A success message is displayed once the data has been successfully INSERTed. If you're familiar with building MySQL-based Web applications with PHP, the procedure above should be familiar to you - the only difference lies in the functions used to communicate with the database server. And that's about all for the moment. In this article, you learned how to use PHP to communicate with that other open-source RDBMS, PostgreSQL, applying PHP's built-in functions to extract and insert data into a PostgreSQL table. In addition to learning a number of different techniques to extract data, you also got a quick tour of how to use transactions with PostgreSQL, and of the error-handling functions available to help you debug your PHP/PostgreSQL scripts. Needless to say, there's a lot more you can do with PostgreSQL - this article merely covered the basics. If you're interested in learning more about PostgreSQL features, and in the PHP functions that can be used to avail of those features, take a look at the links below. And until next time....stay healthy! Note: All examples in this article have been tested on Linux/i586 with PostgreSQL 7.1, Apache 1.3.20 and PHP 4.2.0RC2. Examples are illustrative only, and are not meant for a production environment. Melonfire provides no warranties or support for the source code described in this article. YMMV!